Plumbers from Marietta GA have the knowledge, tools and experience to repair and replace your pipes and other things that are causing the issues. Many home and small business owners prefer to tackle any improvement projects or maintenance needs as they arise. 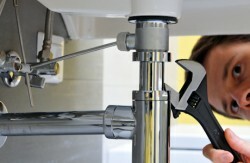 There are time however when a professional plumber in Marietta GA may need to be called. The important thing to keep in mind is when to do this. The last thing you want to do is to create a larger problem that can sometimes double the original expense had you called the plumber to begin with. A lot of smaller projects like fixing a leaky pipe, replacing a faucet or installing a dishwasher or garbage disposal can be accomplished on your own. In fact, many plumbers prefer that you do these smaller projects because they have a hard time justifying the cost to the consumer when they make the initial trip. There have been tremendous advancements in the tools and products that we can now buy. Many faucets and other items now come in one piece, are washer-less and are self cleaning or self maintenance. The same goes for toilet parts and water pipes. They come pre-packaged or are very simple to replace. But, there comes a time when enough is enough. A small drip or leak in an obscure place can cause serious damage. Whether it’s under a sink, bathtub or toilet, try to fix it yourself initially. However, if the first attempt is not successful, then it’s time to call in the professionals. Plumbers from Marietta GA have the knowledge, tools and experience to repair and replace your pipes and other things that are causing the issues. In comparison to the expensive damage and cost it would take to replace floors, walls or other things in your home, their rates are very reasonable and well worth it. Simply look them up online, or pull out the local telephone book. They also are available typically after hours and weekends.